set the Windows XP machine to connect to the net through the Windows Vista machine. Everything was fine and the Internet Gateway icon showed up on Windows XP network connection. Except that the Windows XP machine still can’t connect to the net. What to do? 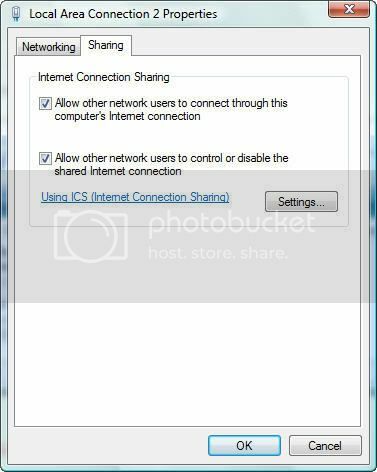 1) Disable the internet connection sharing, if it’s already enabled. Don’t forget to enable the automatic IP address assignment. 2) Open Control Panel / Network and Internet / Network and Sharing Center. 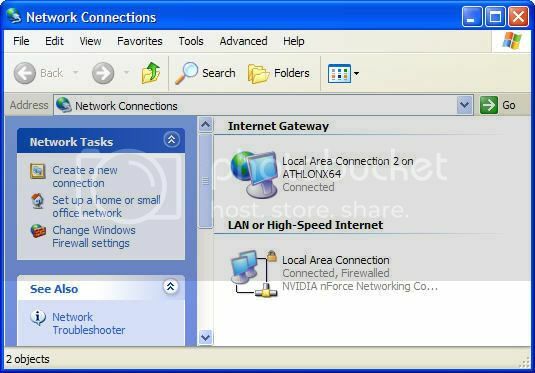 Click Manage network connections on the left taskbar. Select both LAN connection and internet connection. 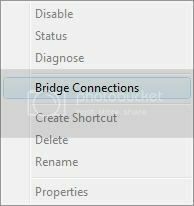 Right click and select Bridge Connections. …until the bridge is enabled. 3) Right click on the Network Bridge icon and select Properties. Click Continue on the UAC dialog. On the Adapters box, uncheck the internet connection. 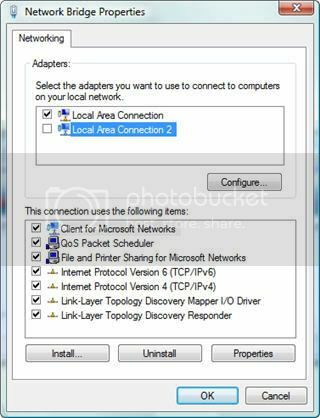 Click OK.
4) Back on Network Connections window, right click on the internet connection icon, and select Properties. Click Continue on the UAC dialog. Select the Sharing tab and check both checkboxes. Click OK.
It’s done. Wait a minute and both Windows Vista and Windows XP machines should be able to connect to the net. If this is not the case, just restart both machines. Can Ubuntu use Windows Vista ICS? In my case, no problem. 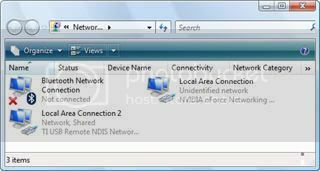 My Ubuntu 7.04 installation can connect to the net through Windows Vista ICS. I don’t even need to set up anything on the Ubuntu machine. Now that you mention it, perhaps I should. I’m trying to do ICS from my vista dell laptop to my xbox 360. When I try to enable ICS on my laptop, it comes up with “an error occured while Internet Connection Sharing was being enabled” then closes out. Help? saya punya koneksi internet via LAN, dan saya mau menn-sharing koneksi itu dengan laptop via wireless. saya sempat bisa meng-enable-kan ICS, tapi karena ada masalah di laptop, ICS belum terkoneksi, kemudian saya melakukan bridging antara wireless dengan LAN. saya baca di internet itu cara cepat mensharing koneksi. yang terjadi malah koneksi internet via LAN malah mati. kemudian saya remove bridgingnya. setelah saya membenahi komputer laptop. saya mencoba men-setting ICS lagi. tapi tiap kali saya mencoba enable ICS di koneksi internet LAN, selalu ada message error. saya mencoba melakukan apa yang dituliskan Anda di blog ini tapi belum berhasil. ada masukan? oh ya, kalo di vista, bagaimana caranya meng-enable automatic IP address assignement? Agreed. Ditched it already for Windows 7. Big Problem here is that once you bridge the connection you by the separation of chruch and state here. By that I mean the ICS is to keep the client computer(s) firewalled and separate from the internet. Bridging bypasses this firewall and thus exposes everyone to the open internet. Not good. Plus bridging presumes you have DHCP on your router turned on, which if its your home, it probably does and thus it will connect. Just be careful when you do this bridging.